Our Crystal Clear Melt and Pour Soap Base is the clearest soap on the market with a clarity score of 10 out of 10. It is perfect for embed paper and creating designs where clarity is vital. The twenty-four pound big block is ideal for larger projects, as it will make (96) 4 oz. bars of soap. Soap comes in a blue bag with twist tie and corrugate box. A single block measures 13 x 11.5 x 6 inches. COMMENTS: Love the clarity of this soap. Works great if using printable embed paper or other fun embeds like toys etc. This soap also has great lather compared to other brands I've tried. COMMENTS: This is so clear!!! I thought the premium extra clear was clear! But this????? Woooowww!!! Get it! COMMENTS: This works beautifully in all my products thus far. It has a great lather and it’s not nearly as drying to the skin as I was expecting. I do still add extracts to make it more moisturizing, that’s all I’d change if I could. I’m in love with the shave & shampoo soap because it’s filled to the brim with skin loving ingredients, but it’s a bit spendy so I look for good soaps to mix it with. I really like this one so far. COMMENTS: Used as the clear tops for embed soaps. Handled well with very little sweating in our humid climate. "Great value on clear soap base"
COMMENTS: The price is very good and more importantly it works well. It was really clear and worked well in my picture bars. My soap came out wonderful (coupled with the WSP water soluble paper). COMMENTS: I love this Base for making artistic soaps! COMMENTS: I get an extreme clarity with this base and it's more than perfect for embeds! "Clearest of all the clear M&P we have tried"
COMMENTS: This is a fantastic base for adding embeds and printed water soluble paper. Great base at a great price, love it! COMMENTS: I did not find this to be crystal clear like stated. I have used it in making clear soaps and it still is hazy, not that crystal clear effect you want. Also it has to be wrapped right away or you get glycerin sweat. COMMENTS: This product is truly clearer than the rest. The Premium Crystal Clear Soap Base is just that. It is great when used in soap where there is dissolving paper and you want the image to be very clear. I also use it when I really want to show off my embeds in the soap. It gives all of my soaps that clean crisp look. I love this product and am in the process of ordering more. COMMENTS: I use this M&P when I want to make a design in CP stand out, and look extra glossy. It’s also really pretty with color in it because it maintains its transparency so long as you don’t oversaturate it with mica or TD. The only drawback I have found using this is that it looses color and most FO scents overtime. Yellow and purple are the worst for me, for fading color. Overall it’s my favorite M&P out there. COMMENTS: This Premium Crystal Clear Soap Base, as a thin top layer, is what I chose to use for guest-sized soaps that would have various holiday graphics embedded therein. All I can say is "WOW" --- the results have been incredible! All the graphics, which were laser-printed on Crafters Choice™ Embed Paper for Soap (Water Soluble Paper) that I also purchased here, came out perfectly visible in full gorgeous color. Over the embed layer, I poured Crafters Choice™ Premium Ultra White MP Soap Base. I've also used this for creating M&P soap crystals. It's really a fine product! COMMENTS: This really is crystal clear! I have never had a soap so easy to work with and so completely free of cloudiness. Even when I didn't use best practices (stirred too much, etc) my soaps came out looking like gems. "Best Base in the World"
COMMENTS: So clear and easy to use. Luxurious bubbles and did not dry my skin out. Love it! COMMENTS: This base has become our go to for anything with embeds. Customers love it! COMMENTS: I LOVE this base,fast setting and no problems with sweating. COMMENTS: I love this soap base. It does not yellow and is so clear that my imbed soaps always come out beautifully. I would not use any other base for my imbeds. • Makes beautiful imbed soaps. • Is easy to use. COMMENTS: I use this brand alot! Holds color very well! COMMENTS: Im so impressed with this soap base. So clear and bubbly. Great suds. Crystal clear projects and colors come right thru true. COMMENTS: I love being able to buy it in bulk! COMMENTS: This is a very good way to cut the cost of every melt and pour project. I love the level of performance and clearness of product. Easy to cut off large block and replace bag covering for storage. Will definitely purchase this one again! COMMENTS: wouldn't go w/o it! Great base, no problems with sweating. COMMENTS: Love this! It really is perfectly clear, and shows off my embeds. COMMENTS: I love this stuff. It lathers beautifully. Very happy with product. COMMENTS: I guess I'm doing something wrong because my soaps were not crystal clear. It lathers well and takes color well. The 24lb block is hard for me to cut though. COMMENTS: I have used this base to make picture soaps and they work great! Love this, will be ordering more! COMMENTS: I really like this MP base. It is easy to work with and I appreciate being able to get the larger quantity. COMMENTS: I don't know how you could be disappointed with this. It is perfect for everything I have used it for. COMMENTS: A perfectly clear soap base. Shows off embeds nicely when no colorant is added but also handles color well. COMMENTS: Very Clear Very Nice! COMMENTS: I use this soap all the time. It's great for kid's products. It binds well with ultra white if you are layering. It is great when used with the glitter powder. It turns a little foggy with some frangrances and turns a honey yellow with others, but some like the Abolone and Sea, it stays very clear. COMMENTS: This is hands down my most favorite soap base to work with creative wise. This is the clearest melt and pour you can buy. I used this along with my logo printed on water soluble paper and you could see every detail of my logo through the soap. Love it. COMMENTS: This soap is easy to use and is great for suspending toys in the soaps. "Customer love this soap base"
COMMENTS: This soap base has always produces excellent bars of soap. It lathers real well and cleans great yet leaves skin soft. Many of my customers use it for shaving also and like it better than shave gels. Love it! COMMENTS: This is the best clear base I have used. I love the clarity of it and how easy it is to use. My embeds look awesome in this base. COMMENTS: This is an excellent melt and pour base. I am able to create colorful soaps filled with different micas and glitters and the colors really shine through. Purchasing it in the 24 block saves money. Easy to cut off of the main block. Melts like a dream and is easy to work with. COMMENTS: I use this for a variety of special type soap and love the quality of the product. Great lather and it takes scents and color beautifully. COMMENTS: I really do like this base, but it I am not so sure that the clarity is much different than the Ultra Clear. Even without fragrance mine was not crystal clear. Not saying that it wasn't an issue of my own making...but several projects were not 100% clear. This will still be my go to base!! Some reviews comment on the strong smell of the base, it does have a smell but I love "that" smell. Very easy to work with and not as drying as a lot of clear bases. COMMENTS: I love to see my soaps very clear, transparents. COMMENTS: We embed toys in this soap for kids. They love it. They get clean, & get a toy in the end. COMMENTS: This is a wonderful base that I will never be without. Colors are so vibrant in this base. Love it! COMMENTS: Love the lather and does not dry out skin. I will definitely use again!! COMMENTS: One of my favorite bases. Super clear. Large block is great bargain. COMMENTS: I highly recommend this melt & pour base. It works well with my fish-in-a-bag soap. COMMENTS: If clarity is important, this is your soap! Has a faint chemical smell, but not enough for me to complain about. Perfect for my embeds. COMMENTS: I bought this crystal clear soap to make the snow globes. The end result was a cloudy surface I couldn't remove no matter what I tried. I then made it without scent-same results. They didn't look like the picture on the recipe page. It does look nice for my loofah soap. COMMENTS: Takes color very well and holds scent beautifully. COMMENTS: Super clear, easy to use, mixes with micas perfectly. COMMENTS: I found this M+P to be VERY clear, yet hard to mask the scent. It has a stronger odor then others I've tried. I did find this particular batch was more "sticky" after pouring and cooling. COMMENTS: Because I never know what I want to do with my clear, embeds or adding color and additives, I like to use this base. It is super clear. I used to get the premium and I still like it but I do think this is clearer for my embeds. I think it holds the colors & fragrance. COMMENTS: This truly is an extremely clear base. I use it in my picture soaps with great results! COMMENTS: This base is so clear, I love it! It's great to make soaps with little toys inside. It doesn't get cloudy with colors and scents. It's perfect. I keep coming back for more. "clearest m&p base I've ever used!" 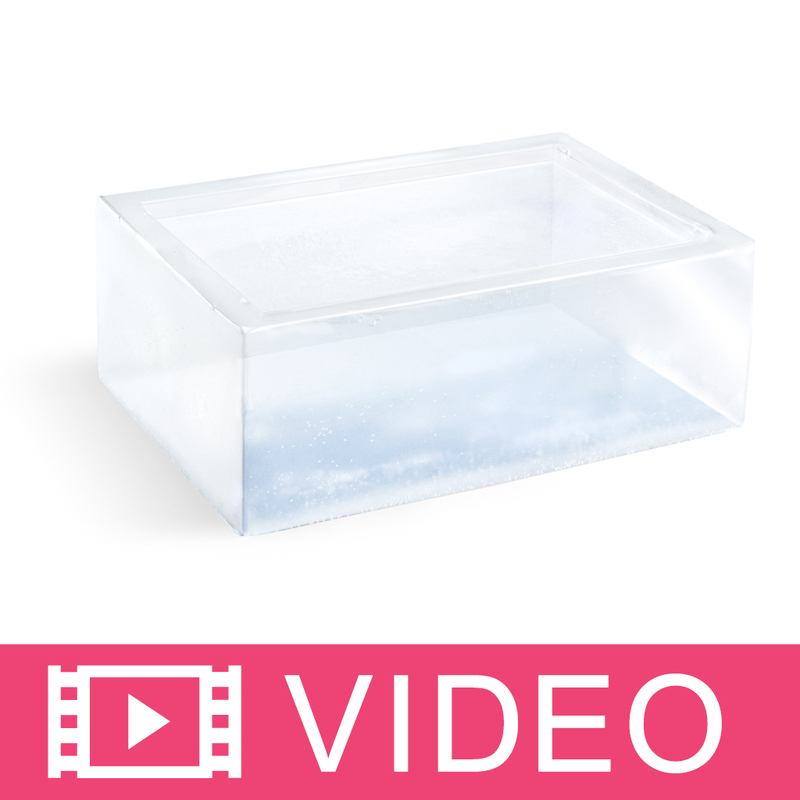 COMMENTS: this base is so clear i can make my fish soaps with absolutely no cloudiness at all. its the only soap base i use to make anything requiring embeds! COMMENTS: Lives up to it's name. Thanks for this great product, highly recommend. COMMENTS: Will only use this. Super clear. Beautiful, Perfect soaps every time. NO sweat! Honest! I'm in Texas. My soaps set in sun on display and sold like hotcakes! So happy with this product. Used the base clear soap also...it is equally as nice to use just not quite as clear. I will use the premium when my soap must be clear with out color to show embeds, etc. but the base clear is great for all other projects requiring clear with color. Love it! Takes a load off my mind, knowing I don't need to worry...soaps come out great. Customers really love it and its fun to design with. Good soap, even better with added clays, buyers, oils, etc .24 pound block is easy enough to use. Gently pull plastic bag out of soap where it is stuck...no big deal. Plan ahead on how best to cut it up to save time,I cut mine all at one time and store in giant zip lock bags. Have fun! Thanks ESP for a wonderful product. COMMENTS: I love wsp's m&p soap bases and this base in particular is wonderful for making my "fish in a bag" soaps that sell extremely well. This soap base is so nice that I've had customers wonder why a soap vender was selling pet store fish & what they should feed them :)!! COMMENTS: Absolutely my favorite clear soap. Easy to cut, easy to combine with other colors, always great for embedding. I bought some and ran out within a week ! I have to triple my order! COMMENTS: This lovely crystal clear soap is the best by far - and I've tried them all!!! Will never go back to the others! I know it is more cost effective to pour directly into the bag, but my only criticism is in the packaging - the bag often imbeds itself in the soap! Can be a struggle to remove it! Won't keep me from continuing my purchase of it though! Love it. COMMENTS: This base is MUCH clearer than the detergent free base. Colors came out much more vibrant and I will be buying this clear base from now on. COMMENTS: Best base by far - crystal clear for embeds. Can have a bit of a yellowish tinge in the Big Block but doesnt carry over into product. COMMENTS: I love this soap as I use it for many things. I use it for all types of scrubs I make, as well as my turtle and fish soap. Very clear, and stays clear even after everything is added in. COMMENTS: This soap is so clear!!! COMMENTS: The BEST and clearest soap base out there!! COMMENTS: I love this base. It is the only clear base I order in large quantities. Super clear! "I LOVE THESE SOAP BASES! " COMMENTS: This was my first time EVER trying a melt & pour soap. I had absolutely NO experience soaping. I LOVED this soap base! I have been able to experiment with many different things...basic soaps...mixing fragrances .mixing colors...imbeds...the possibilities are ENDLESS! The more I dabble...the more ideas i come up with! And with the INCREDIBLE LOW PRICE...AND FREE SHIPPING...there is a lot of fun and creativity to be ad for a small investment! I HIGHLY RECOMMEND!!? COMMENTS: This MP soap works just fine for embedding, but I didn't notice a difference between this and the Premium Extra Clear. Either one works just fine for my purposes. COMMENTS: I use this base to make my popular fish-in-a-bag soaps. It really is crystal clear! Because it costs more, I only use this for projects that require a perfectly clear base. However, this is the CLEAREST base I have ever tried! I will definitely be back for more! It is totally worth the extra expense to get a crystal clear base! "Inexpensive, but not crystal clear with additives"
COMMENTS: It is a good, inexpensive base. But it is only crystal clear if used as a plain base. FOs dilute the color. COMMENTS: ... base. Reorder often!!! "VERY nice product and crystal clear!" COMMENTS: I made some rubber duck Christmas and Valentine's day soaps and they turned out AWESOME! This soap made the bottom of the Christmas soaps look just like ice. Will order again! COMMENTS: Love what I can do with this base! Lots of bubbles, leaves skin feeling silky smooth, embeds show through clearly, leaves enough time to work before setting up fully, takes colors and fragrances wonderfully, even with a remelt the bubbles are still beautiful, great price,melts evenly, and the list goes on and on! Just an allover wonderful base! COMMENTS: The first embedded pictures bled through and blurred. The next time I remembered to hairspray the picture and let set for one day before embedding. It worked perfectly and the customers were thrilled. COMMENTS: This soap is remarkable. Clear soap bases had become my least favorite performers and this base has single-handedly renewed my faith. COMMENTS: Love this soap. It is the base of many of my best selling soaps. "Excellent for Embeds and Swirling!" COMMENTS: Love this base for embeds and how the clarity allows for the color, micas and glitters to shine through! COMMENTS: Ordered for Girl Scout projects with 4 and 7th graders, everyone was able to use it well with ease. Girls loved making their soaps with this, ordering more now. Base hold scent and color well, I suggest getting the stain block colors they are awesome in this soap base. COMMENTS: I have been using the other clear soaps for my embeds. I thought I would try this when they had the sale on it. I could not believe how much more clear this soap is than the others. I am hooked for sure! I will still use the other clear soaps for my "transparent soaps" with color added because they are less expensive, but for my embed soaps, this is all I am going to use from now on. "Is this also a suspension soap?" Staff Answer This MP base is not a suspension base. Crafter's Choice does not offer a suspension MP soap base. "Would this be considered true soap? " Staff Answer Our Detergent Free bases can be considered "true soap" as there are no added detergents in this base. "If I put the fragrance oil in at 3%, where would I list the fragrance oil in the list of ingredients? Would it be listed in the same place for 1% for essential oils? If not, where would it be listed? " Staff Answer At 3% or 1%, these would both be listed at the end of the ingredient list for this product. "Is the base clear enough to be used when embedding your water soluble paper and you really want the printed design to show through?" Staff Answer For using embed paper, we recommend the Premium Crystal Clear to give you the best clarity. Staff Answer This soap does not normally sweat. If making in humid weather you may experience some sweating but be sure to wrap in airtight packaging. "I'm using this base for kids soaps. Are they tear-free? Also would this be a good base for someone that has sensitive skin? (Ex: eczema) Thank you!" Staff Answer None of our soap bases are tear-free. You might try our Detergent Free Baby Buttermilk Soap Base which is our mildest for use on sensitive skin. "Is the Crystal Clear Soap Base gluten free?" Staff Answer Yes, the Crystal Clear Soap Base is gluten free. "I am comparing the two Premium and Signature Crystal Clear Soap Bases that you carry. I have noticed that Sorbitol is the only difference. Can you tell me what difference that might cause between the two bases? Thank you"
Staff Answer The main difference between our other clear soap bases and the crystal clear is that the crystal clear will give your soap the most clarity. If you want to embed something that can be read or to just have the clearest soap possible, the crystal clear would be the best to use.